"How can I quickly learn to speak English/Polish/etc fluently?" Usually I avoid answering this question directly because (1) I don't like the word fluently :-) and (2) it's a BIG question. So instead I usually ask what's causing the person to struggle with the language, and then focus on helping them solve their particular problem. Now I've decided it's important to finally answer this question definitively in the introduction of this ebook, to clarify what is included in this ebook, as well as what is not included. Read more for the full introduction to the ebook! When I decided to write this ebook, I wanted to make something short, focused, and useful. I knew that if I wrote about everything, I would spend years trying to complete it. 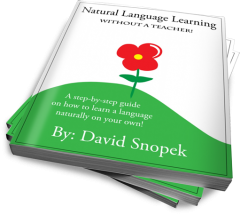 A step-by-step guide on how to learn a language naturally on your own. An extended guide to getting over your fear of speaking. Advice, tips and tricks for practicing speaking (for language learners who have already achieved a high level and no longer have a fear of speaking, but who still have trouble speaking). All the language learning advice already on my blog (over 125 articles at that time) reorganized into an easy-to-read format. ...Because choices #1, #2 and #3 were not arbitrary! They're the three steps to learning a language. No matter how you learn a foreign language, if you went from zero to speaking at a high level of proficiency, you will have passed through these three steps. These steps don't need to happen one after the other - they can be done simultaneously. However, when I was learning Polish, I did them practically in order. First, you need to somehow get the language in your brain. Personally, I did this by reading and listening to Harry Potter. But there are many other ways to get a language in your brain, like taking a traditional course, living in another country, using the "shadowing" method, watching movies, listening to music, etc. Some of these methods are more effective than others, but if you use any of them long enough, you will eventually get the language in your brain. If you're doing these in order, at the "end" of this step (there is never really any end to learning a language!) you will be able to understand anything and form sentences in your head without translating (but not necessarily during a real conversation). One of the most common problems I hear from people learning languages is that they can understand a great deal and they know tons of words - but when they're actually speaking with someone they get really nervous and their mind goes blank. But immediately after the conversation, when the stress is gone, they have no problem coming up with the words they wanted to say. Not all people have a fear of speaking - but most do! Many people are afraid of making mistakes when speaking. They're afraid the other person won't understand them - or even that the other person might laugh at them or think they're stupid. This is a very serious problem and I've written one article about how to overcome it. In the future, I plan to write many more! Once that language is in your brain and you are no longer afraid to use it, you need to speak as much as possible! At this point you develop and practice "speaking strategies" like circumlocution (for when you don't know a word), various conversational phrases to keep things flowing, and even non-verbal tricks to make people more comfortable when speaking with you. This practice will allow you to respond quickly and naturally, without slowing down the conversation. The goal of this ebook is to help you complete step 1 of the 3 steps. I think this is great because it's probably the most important and the most misunderstood step. Few people know the true mechanisms by which the brain learns languages - and even when they do, it can be difficult to decide how to use them in practice. A practical part where I give you a step-by-step guide to developing your own method based on these ideas. Unfortunately, this also means that steps 2 and 3 aren't discussed in this ebook. However, there are a few articles and videos on these topics on my blog (linked above) and I plan to write more. Thanks for taking the time to read this ebook! I hope it's helpful on your language learning journey. What do you think of the introduction? Does this sound like an ebook you'd like to read? If you'd like to receive it, please subscribe to my blog and it will be emailed to you when it's finished! I’m looking forward to your e-book. Actually, now I very passionate about learning tips & tricks and it has helped me to move my skills to the next level. So far I’ve read a few books like that by Steve Kaufmann and Aaron Myers you had recommended lately (laying out $20 :). They are a wellspring of useful information and inspiration. I'm glad you enjoyed Steve's and Aaron's ebooks! I haven't read Steve's in a couple of years, I wonder if he's updated it any? I'll have to give it another look. "For this reason, the ebook is broken into two parts"
It's normal English and doesn't have a negative meaning. Unfortunately, it's really hard for me to say what is formal and informal. :-) I can tell you it's used in this way a lot in business - it's very useful for talking about plans. For example: "Our marketing strategy for this year is broken into three main campaigns." I see, thank you David very much for clarification, you're always helpful. So would you say it's better to say "strategy is broken into" than "strategy is divided into", right ? When we use the verb "to divide" then ? A friend gave me your site which I am new to. I am learning Polish which I have been learning it now just over a year which is hard. After looking on your site I think Its amazing, I feel a lot more confident with myself and the help on your site as made me look at it a different way on how to learn and understand another language. I travel to work 5 days a week so I play the Polish cd in my car it takes me 20 min to my work and back. I have just watched the video from Professor Arguelles which is good and hopefully help me. Listening in your car is a great way to learn! I'm glad you're finding my blog helpful. Best of luck with your Polish studies! I am looking forward to reading your e-book. By fluency I understand to have got the ability to speak smoothly. Once my Norwegian friend said to me:" The most important thing is to understand and to be understood." I think a good way to improve own speaking is to forget about being perfect.I mean - speak a lot. Everyone's goal is different but I have a very similar goal to you. I simply want to understand and speak comfortably - not necessarily perfectly correctly. I definitely think it's good for people to stop worring so much about mistakes. 1. Learners listen to and pronounce each sentence of English conversations (thematic dialogues and narrative texts with transcripts). 2. Speaking on each conversation topic (imitation of dialogues (role play), ready-made thematic questions and answers with helpful content for using in daily life, narrations/telling stories, talking points and discussions of issues). 3. Learning of additional conversation sentences and vocabulary from English phrase books, conversation books and general thematic English dictionaries that provide useful usage sentences. Making up one's own sentences with difficult vocabulary for potential use in daily life. 4. Extensive reading of thematic texts and materials from various sources. Telling the content of thematic texts. 5. Writing on real life topics. As you know word combinations in speaking are unpredictable. There are different word collocations/phrases and synonyms to convey a thought in English. It's possible to encompass in ready-made materials a wide variety of English phrases for each conversation topic. It is a good idea to prepare a potential list of phrases with sentences on each conversation topic, for example fixed conversational phrases that do not require English grammar knowledge (greetings, forms of addressing a person, thanks, well-wishing, apology, agreeing, disagreeing, emotions, etc.). Practising English with such materials can help a learner easier choose the most appropriate word combinations to convey a thought. Multiple frequent reading of such sentences in English will gradually ensure firm memorisation of English vocabulary and contribute to developing good speaking skills. By combining the most inclusive English phrase books, conversation books, general English thematic dictionaries, software, audio and video aids and websites you can create the most practical and thorough content for mastering each conversation topic in English for all levels including a wide selection of ready-to-use phrases, vocabulary and sentences for daily use. It is important that learners make use of various aids to improve their English conversation and vocabulary skills: audios, videos (English learning videos, travel videos, etc. ), Internet resources, English learning magazines, newspapers, newsletters, radio programmes (especially the BBC English learning programmes/materials), TV programmes (educational programmes, documentary films, movies, news), books and e-books on a variety of subjects, online communication with native English speakers (chat, email, Skype). Good libraries and the Internet have a wide selection of English learning aids. There are quite a lot of ready-made conversational dialogs on a multitude of topics with authentic natural wording with useful content (vocabulary) for practice at all levels of difficulty from basic to advanced levels. It's hard and time-consuming for learners on their own to create such dialogs with diverse content as this would require a lot of imagination about potential content of conversations in various situations and issues of discussions. Therefore it is a good idea for learners to select ready-made dialogs with the most practical helpful content at all levels of difficulty and with the best wording in terms of vocabulary. So learners can select at their own discretion a number of ready-made dialogs on each real life topic. On the basis of those ready-made dialogs learners can create their own dialogs taking into account their potential needs, preferences, circumstances and personal situation. It is a good idea to record one's speech on audio and to compare it with the original text or audio recording.